DODGE CITY, Kan. – In all the years Justin Rumford has been to Dodge City, he’s been to just one performance of Dodge City Roundup Rodeo. That changes this year, when he will be one of the featured acts at the annual rodeo, set for 7:45 p.m. Wednesday, July 30-Sunday, Aug. 3, at Roundup Arena. This year’s rodeo also features and Xtreme Bulls Tour competition, which will take place at 7:45 p.m. Tuesday, July 29. 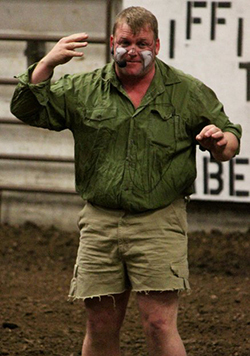 Rumford is a rodeo entertainer and clown, and he’s pretty good at it, too. The last two years, he was recognized as the Professional Rodeo Cowboys Association’s clown of the year. This past December, he was recognized as the 2013 Coors Man in the Can, the top honor for rodeo barrelmen. In Dodge City, he will share the arena with the sport’s greatest stars and another amazing act, California-based Riata Ranch Cowboy Girls, which will showcase trick riding, trick roping and roman riding skills; they were nominated for the PRCA’s dress act of the year in 2011 and 2013. “Our committee has worked very hard to bring the top talent in ProRodeo to Dodge City, and we’re very excited to have Justin and the Riata Ranch girls with us this year,” said Dr. R.C. Trotter, chairman of the volunteer committee that produces the annual rodeo. “This will be the third time the girls have performed at our rodeo, and they’ve always done an outstanding job. There isn’t a job in rodeo that Rumford hasn’t done. His grandfather, Floyd, founded Rumford Rodeo Co., and he was involved in the family business from the time he was in diapers. Now the Kansas cowboy has found his niche, bringing a comedic personality to the arena. It’s paid off quite well. “It really means a lot to me to be able to work Dodge City,” he said. “When I talked to Dr. Trotter, I was so excited, especially since Lance Brittan was one of my biggest heroes when I was growing up, and he still fights bulls there. The red carpet is equally on display for fans, whether its rodeo’s biggest names battling for the large purse or Rumford’s side-splitting comedy or the Riata Ranch Cowboy Girls’ Western showmanship. “We don’t just trick ride or rope,” said Jennifer Welch Nicholson, who runs the operation. “We actually work with choreography, so we have a full production. We really work on timing and production and making the show make sense to the audience. That combination has earned the Riata Ranch Cowboy Girls grand acclaim. They are known worldwide for their work and have traveled to 18 countries – and all across the United States – performing. Being a two-time nominee for the PRCA’s dress act award is a tremendous honor for her and the rest of the team. “It’s wonderful to think that our peers think enough of our show to nominate us,” Welch Nicholson said. “There’s a lot of great talent out there. It also provides a great deal of entertainment to rodeo fans.